This is the first time I’ve delved back into The Black Company since I first became acquainted with the series about eight years ago. Although at first I struggled to immerse myself in Cook’s writing, it quickly became a very enjoyable read and a refreshing change from some of the doorstops I’ve been reading lately. The Black Company is written from the point of view of Croaker, a physician and annalist working for a mercenary force called – you guessed it – the Black Company. The Company have been hired by The Lady, an ancient tyrant who, along with her monstrous generals (twisted supernatural beings known as the Ten Who Were Taken), is intent on defeating the Rebel armies and ruling all the known lands. I’ll admit I struggled to get to grips with the novel at first, being somewhat taken aback by Cook’s curt writing style. The Black Company is largely comprised of brusque prose and terse descriptions, which lends even major scenes an air of “blink and you’ll miss it”. The novel is a little disorientating at first, skipping over major events in the storyline in between paragraphs, but the style is something I quickly became accustomed to. 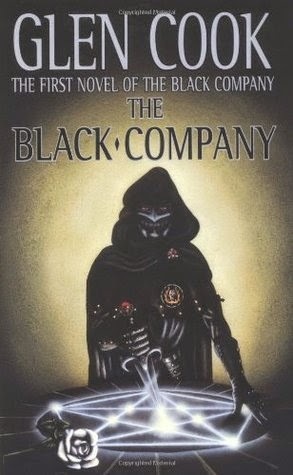 I think The Black Company is the first example of ‘grimdark’ I ever read, and I still remember the thrill I had when first reading it (even if I don’t remember much else). A bunch of characters who are actually fighting on the side of the bad guys? At the time I’d never heard of anything like it, though of course nowadays grimdark tales are a dime a dozen. One thing that stands out here is the way Cook really does emphasise the mercenaries’ . . . well, mercenary nature: Croaker and the rest are almost always motivated by greed and selfishness, and yet still somehow come across as sympathetic (well, most of the time). Cook has created a grim, eerie, satisfyingly dark world, and does a great job establishing it here. His casual references to the Taken help contribute to the dark atmosphere, with evocative (if slightly unimaginative) names like Nightcrawler, Soulcatcher, Moonbiter, Bonegnasher, The Howler, and The Hanged Man. They lurk threateningly on the periphery of the story, shrouded in mystery, and I think it’s brilliant. However, I do wish they’d played more of a prominent role in the action: they add a thrill of horror and threat to the story, but unfortunately seem to do little else. The Black Company is packed full of action; however, most of it is tersely described from a distance, as befits the premise of Croaker as annalist. This can make it come across as more of a list of events, and as a result it can be a bit dry at times. I also found myself having a bit of an issue with the sheer numbers involved. Cook informs us that there are hundreds of people in the Black Company, yet we only ever see a handful, and the others are barely even mentioned except when Croaker infrequently refers to the Company as a whole. It was difficult for me to reconcile my initial image of a relatively small group of mercenaries with the massive force we’re told they are later in the book. Similarly the description of the battle towards the end didn’t really seem to add up. We’re told repeatedly that the battle involves over 250,000 combatants, yet the author never really manages to convey the true scale of the conflict – instead it just seems like he’s listing numbers. One final issue: while I do really like having the story narrated by Croaker, I find that the biggest problem with using a single first-person narrator lies in finding pretexts for having them witnessing or participating in key events. In this case I found the pretexts for getting Croaker in the thick of things (namely getting sent on special missions by the Lady again and again, despite not being one of the most skilled fighters in the company) to be a bit flimsy. However, I did enjoy how the plot of The Black Company twists expectations: the sub-plot actually ended up becoming the main plot, with its resolution feeling almost more climactic than that of the main conflict. So. When I first started my re-read of The Black Company I almost put it down again, as I struggled to see how I’d enjoyed the series so much all those years ago. But it didn’t take long before it booked its ideas up, and now I can’t wait to revisit the rest of the series. When I first read this years ago it did nothing for me at all. It's interesting to me how you said you struggled with your reread, but then eventually got back into it again. I wonder if I should pick up this series to give it another try as well. I can definitely see how it wouldn't be to everyone's taste. The terseness of the prose can leave the reader kind of cold, at least at the start. I love the series though I stalled out somewhere along the way and have not ever finished it. But The Taken are my favorite villains ever, the visual of Limper tearing through the country side is still in my mind.